See your heat pads working with the all new Osborne Heat Pad Indicator Light. The Heat Pad Indicator Light provides visual confirmation that individual Stanfield Heat Pads are drawing electricity and providing heat for newborn piglets in farrowing and growing pigs in nurseries. The system features a patent-pending two-light system. The red LED shows that the electrical circuit is functional, while the green LED indicates that individual heat pads are drawing electricity and providing heat. 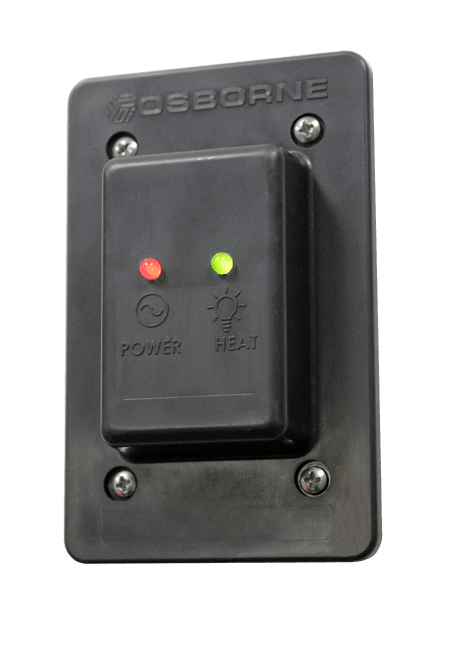 One Heat Pad Indicator Light system is used per heat mat and eliminates the need for infrared temperature wands or physically inspecting each pad to ensure it is properly operating. 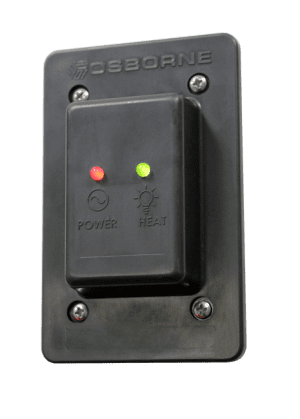 Designed for hardwire installation onto a weatherproof, non-metallic, single-gang electrical enclosure. Installation must be made by a trained, qualified service person in accordance with the National Electrical Code (NEC) and all applicable local codes and ordinances. Dimensions (L x W x H) 4.8 x 3 x 1.4-in. Installation Installation by certified electriction only. Mounts on sealed single-gang electrical boxes.